Justin Raimondo, a contributor to numerous ultra-right media outlets and editorial director of the mis-named “Antiwar.com,” has now chosen a new target for his diatribes. At the end of July and early August, for two weeks running, he has concentrated his fire on the organized antiwar movement in the United States—claiming that it is dominated by the socialist left. Raimondo singles out Socialist Action as a major culprit, accusing the organization of trying to “pack” the United National Antiwar Conference (UNAC), held July 23-25 in Albany, N.Y. It is not the first time that Raimondo has seen fit to belittle the antiwar movement in his columns, but his Joe McCarthy-style red baiting has now taken these tactics to new depths. What really got Raimondo’s dander up was a workshop (one of 33 workshops at the UNAC conference) in which a multi-sided discussion took place on the topic, “The Rise of Right Wing Populism & the Tea Party: Do We Need a Right-Left Coalition?” Raimondo, an admirer of the America First Committee that was organized for a brief time before World War II, was ticked off that anyone could even put into question the effort to cobble together a similar alliance between progressive social activists and leaders of the ultra-right today. Raimondo’s main objection to Gauvreau’s speech seems to be that she congratulated the assembled demonstrators on having scored a “victory.” Gauvreau pointed out to the protesters that at a time in which key forces in the antiwar movement had been demobilized due to widespread illusions in the Obama administration’s promises, it was important to note that a sizable core of dedicated activists was still marching in the streets (about 6000 people participated in the Washington event). “Earth to Gauvreau!” Raimondo crackles: the demonstration was hardly a victory but a “defeat” for antiwar forces because even more people did not turn out! And why wasn’t the 2009 Washington rally larger? Because the antiwar war movement is dominated by leftists, Raimondo exclaims: “The antiwar movement remains a leftist sandbox, where sectarians get to pontificate—and do little else…” Reading such comments, it should be obvious to anyone active in the antiwar movement that Raimondo has never participated in the work of building the movement, and has no idea what is takes to do so. 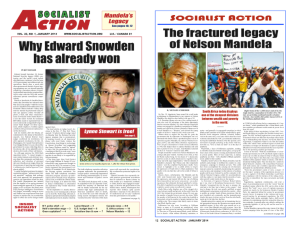 He brings up an article by Christine Marie in the May 2010 edition of our newspaper, Socialist Action, which argued against the idea of building a “Left-Right Alliance” in the antiwar movement (http://www.socialistaction.org/marie6.htm). The article dealt in part with the America First Committee. Contrary to Raimondo’s allegations, the Socialist Action article does not state that the America First Committee was “pro-Hitler.” Nor does it describe the committee as “anti-Semitic,” though its major public spokesperson, Charles Lindbergh, certainly was. The article does point out, however, that the committee never served as a vehicle for principled antiwar activity. The corporation heads and others who founded and funded the committee believed that the opportunity had not yet arrived to join the effort around World War II. Raimondo does not try to refute these facts. He goes on to quote another passage from the May 2010 Socialist Action article: “To involve the great majority of the working people of the United States today, the antiwar movement must be a safe place for the most militant and combative components of the unions and of community struggles. It must seem relevant to those whose first waking thought is how to find a job or keep their house. It must be welcoming to the 200,000 LGBT activists who recently marched on DC. Chris Gauvreau wrote a reply to Raimondo’s attack on the antiwar movement, which was printed by Socialist Action and other websites. The main theme of her article appears in its title: “The Antiwar Movement is not Stalled but Reawakening,” (http://socialistaction.blogspot.com/). Gauvreau makes clear that the antiwar movement shows promise of broad unity and strength for the future. She describes the “the vitality and momentum” that was seen in the proceedings of the UNAC conference. She outlines the long calendar of activities approved by the Albany conference—which will culminate in mass national demonstrations in New York City and San Francisco on April 9, 2011. But Raimondo, in his article replying to Gauvreau’s reply, “Folly Left and Right” (posted on Antiwar.com, Aug. 13, 2010), fails to hear Gauvreau’s main arguments. Instead, he declaims on his usual topic—himself and the narrow niche he has tried to carve for himself in political affairs. Right off the bat, Raimondo takes issue with Gauvreau’s (and most people’s) perception that his politics are right-wing. “Libertarianism is neither right nor left,” he says. Pat Buchanan—a former advisor to Nixon, Ford, and Reagan, inveterate Cold Warrior, and vocal opponent of women’s abortion rights—has had no trouble in identifying Raimondo with the political right. Pat Buchanan called Raimondo’s book, “Reclaiming the American Right: The Lost Legacy of the Conservative Movement” (Center for Libertarian Studies, June 1993, reprinted 2008), “a veritable Iliad of the American Right,” and wrote the introduction to the second edition of the volume. Raimondo writes for a number of ultra-right websites and blogs. For example, he is listed on the homepage of Chroniclesmagazine.org as a regular columnist, as is Pat Buchanan. Chronicles is published by the Rockford Institute, purveyors of what has been generally known as “paleoconservatism,” a point of view with which Raimondo has a lot in common. Paleoconservatism generally identifies with the American isolationist “Old Right” of pre-World War II days, and stresses tradition, family customs, “states’ rights,” European cultural identity (they frown on immigration into this country by non-European peoples), etc. As for the point made in Chris Gauvreau’s article that Raimondo was attempting to red bait the antiwar movement—he simply denies it: “There are no citations to back up the charge of ‘red-baiting,’ unless by that term one means accurately identifying the politics of some of the conference participants, including Gauvreau and her comrades.” Citations? I would assume that the reader has seen enough. Did Raimondo not charge that the United National Antiwar Conference in Albany was “leftist-dominated,” against all the facts of who actually participated? Moreover, in looking at Raimondo’s recent posts, it’s obvious that red baiting is second nature to him, as he makes evident in one article, “Rachel Maddow, McCarthyite” (Antiwar.com, April 5, 2010). At least a third of SWP members were police agents? Pure fantasy! He cannot name a single reliable source for that spurious “information.” It is certainly not contained within any of the documents that anyone ever made public concerning the government’s spying on left groups. Publishing lies of that sort, Mr. Raimondo, is red baiting—and slander! How can he prove such nonsense, since everything Socialist Action has written on the subject states the opposite? Only through trickery. He finds an article by the editors of Socialist Action newspaper about the 2008 presidential election on the internet (http://www.socialistaction.org/editors12.htm), extracts a few sentences from it that report on the groundswell of support for Obama at that time, and “interprets“ the sentence as signifying that Socialist Action was “enthused” for Obama. In this, he ignores the major point of the article, which explains why Socialist Action did not support Obama. Gays and lesbians, immigrants, “welfare cheats,” the unions, and Muslims are the problem in America, say the rightists. They hope their rhetoric and lies will divert the anger of working people away from the real source of responsibility for this country’s severe social problems and the worldwide economic crisis—the capitalist system. Now these charlatans want to bring their forces into the antiwar movement. As in the days of the old America First Committee, some right-wingers believe that the current war effort is too expensive and too divisive—and that it runs counter to the isolationist “Republic” they hold as their model. But on other crucial social issues, they line up squarely with the most reactionary of this country’s rulers against the interests of working people and the oppressed. For that reason, a pact between the antiwar movement and Justin Raimondo, Ron Paul, Pat Buchanan, and their ilk would do nothing to build the movement into a powerful mass-based force. It would instead put the continuation of the movement in great jeopardy.